Celtx provides full featured script writing, media rich production support and the ability to collaborate all using one piece of software. Until Celtx, script writers were subjected to bloated and bug ridden software and the pre-production team had been ignored altogether. With Celtx, script writers enjoy using a clean and stable application that includes all the features they need to write. Prior to Celtx, projects were completed using slip sheeted, paper based scripts maintained in bulky three ring binders that included hundreds, sometimes thousands, of attached pictures and hand written notes. Project information, in other words, could only be shared in paper form. Celtx helps you produce all types of media - film, video, documentary, theatre, novels, machinima, comics, advertising, video games, music video, radio, podcasts, and however else you choose to tell your story. 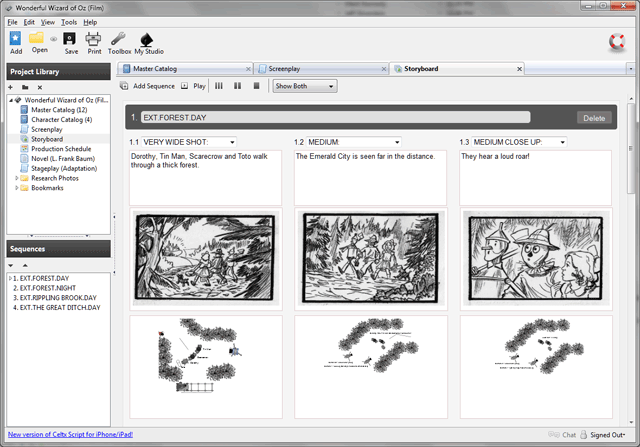 You can use Celtx for the entire production process - write scripts, storyboard scenes and sequences, sketch setups, develop characters, breakdown & tag elements, schedule productions, and prepare and circulate informative reports for cast and crew. Celtx on your desktop delivers the most fluid writing experience - you can always keep your fingers moving as fast as your thoughts and your creative flow is never interrupted. Celtx Studios makes it simple to share projects, manage workflow, and securly store your work. And Celtx Script for the iPhone/iPad lets you write on the move, and sync scripts with your desktop and your Studio. Celtx puts a choice of fully integrated development tools right at your fingertips, giving you total flexibility to determine how your story takes shape. More than 1,000,000 media creators in 170 countries create with Celtx in 30 different languages. Celtx is used by independent filmmakers and studio professionals, and by students in over 1,800 universities and film schools - many that have adopted Celtx for teaching and class work submission.